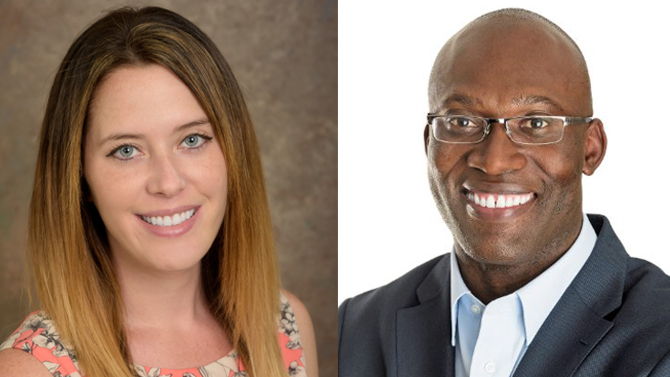 Lerner College MBA students Gervan Williams and Kristen Abernethy are both members of teams that have made it to the finalist phase of the X-Culture Project. The X-Culture Project is an initiative that connects students and professionals all over the world, placing individuals in international virtual teams and challenging them to complete business projects. Some 4,780 participants on 902 global virtual teams from 125 universities in 40 countries completed this semester’s X-Culture Project, and Abernethy’s and Williams’ teams are both in the top 12, or the top 1.3 percent. Abernethy and Williams will receive finalist certificates and be invited to the X-Culture Symposium this year in Miami. The students participated as a requirement for UD business course BUAD 878, Leading Across Boundaries. Course leader and UD assistant professor of management Amanda Bullough called the X-Culture Project a “very worthwhile learning experience” that pushes students to develop their global leadership skills. Williams agreed: “Though frustrating, I learned a lot from the X-Culture project experience; Notably, my perception going into the project was a complete contrast to the actual experience, and limitations or naivety on having a global mindset became obvious right from the start. “I’ve walked away with a newfound respect for the importance of GMI to international team success and an even higher level of respect for the teams that had to work with profound language barriers that often impede the most basic of team dynamic… I will not soon forget this,” Williams continued. Abernethy said, “X-Culture was a unique opportunity in which the development of my global leadership and intercultural skills were tested. Challenges included establishing relationships and coordinating responsibilities with global teammates whom I had never met. Additionally, my team spread across different time zones, making it more difficult to accommodate comprehensive group communication. Visit the X-Culture Project website for more information about the winning teams and to review Williams’ and Abernethy’s reports.